Before smart travellers appreciated the extremely good reasons for travelling with them, sleeping bag liners were the preserve of the hardy campers. And still are I suppose, but for some time now I’ve been travelling with one in my hand luggage – and you probably know how keen I am on only packing essentials. But these lightweight items are worth more than their weight in gold. If you equip yourself with a mid-priced sleeping bag liner rather than a cut-price version you’ll find that it’s money well-spent. You may find that your first use for it is on the plane. It can be hard to sleep during a flight and certainly even harder to get comfortable. Yet comfort is one of the first essentials when you want to sleep. Those blankets that some airlines supply are always way too small for me – and I’ve heard that often they are re-packaged in their clear plastic coverings without being laundered first. Is that really the case? I’m not saying it is but I promise you that a sleeping bag liner will certainly be more comfortable for you and possibly more hygienic. 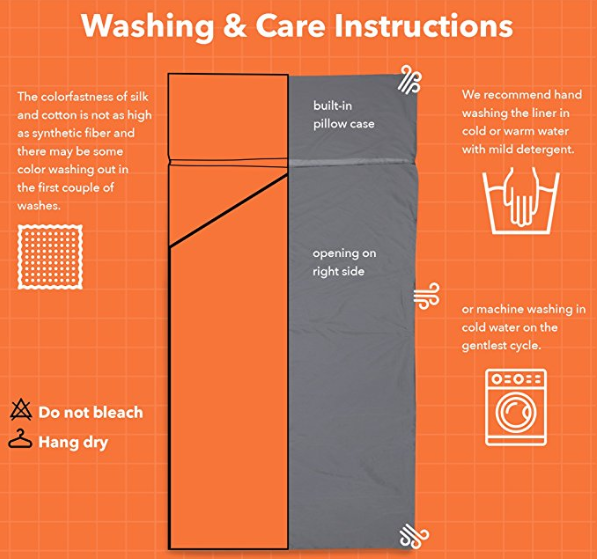 Hygiene is one of the important reasons for using a sleeping bag liner – in addition to comfort. There are plenty of exposé-type articles online – or videos on YouTube – telling us how unclean travelling can be. Seats on aircraft have come under severe scrutiny, not to mention those on trains, buses or ferryboats. 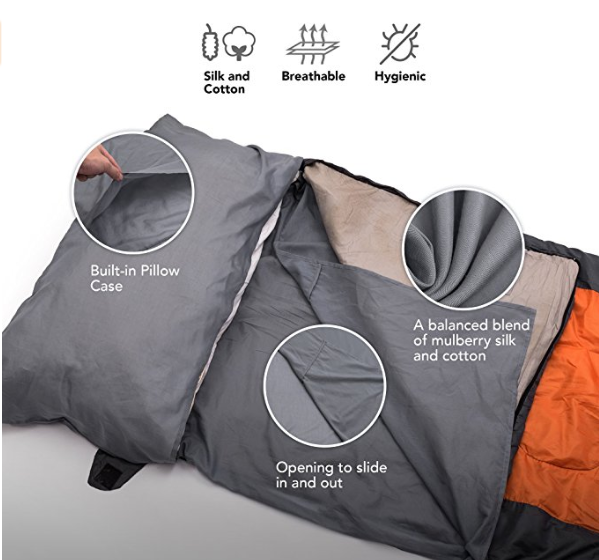 With a sleeping bag liner you’re ensuring that your skin isn’t in contact with anything that might be liberally sprinkled with someone else’s bodily fluids or germs. The same applies to sleeping in accommodation such as budget hotels or hostels. In some countries. 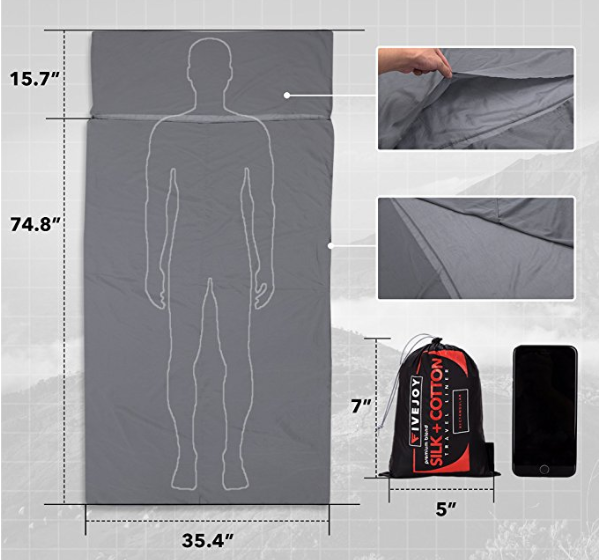 these accommodations don’t provide bed linens – which is no problem for you as you have your sleeping bag liner in your bag and it folds up to a small package which is about the size and weight of an iPhone. The photographs above show the one I prefer. It is a combination fabric of cotton and silk. This makes it hardwearing but extremely comfortable and soft on the skin. It can also be machine- or hand-washed. It’s mid-priced. 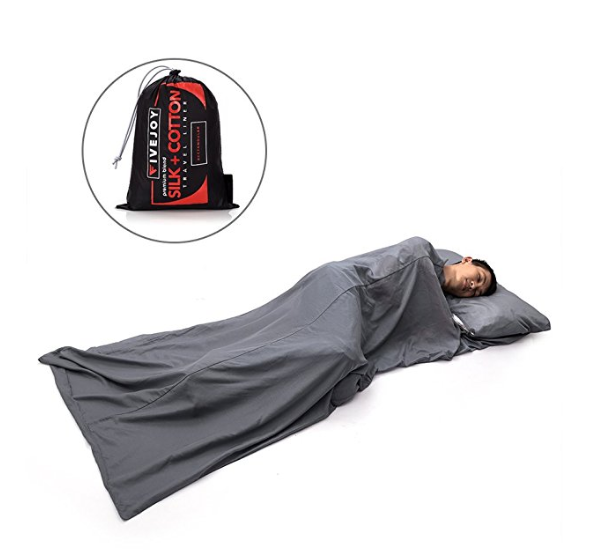 There are cheaper sleeping bag liners available and you can also pay quite a bit more but with the one above, you get all the benefits of a quality product that’s kind to your wallet. YOU CAN READ REVIEWS AND FIND OUT MORE HERE.